The Children's Center is PEANUT FREE. Please do not send peanut butter or any other food containing peanuts in your child's lunch. If sending alternative "nut butters," please indicate by including a note in the lunch box. Children bring their own lunch. Our staff helps the children get seated, wash their hands and sing a grace. They also assist with opening packages and thermoses. 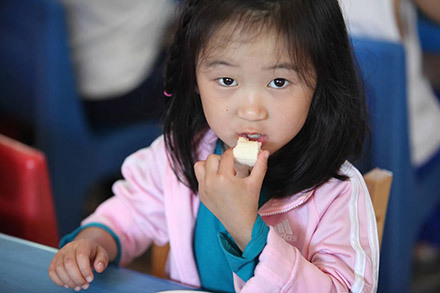 Children are encouraged to eat their "healthy" food first and save their treats for last. After finishing lunch, children will go to "Story Time". Parents picking up children after lunch should arrive by 12:45pm. Afternoon children will be taken to their classrooms. Any child not picked up by 12:45pm will join "Kid's Club".